Welcome to October. The second month of the year after January that people seek out horror movies. In case you missed the biggest news of the week due to it coming out on Friday night, click here for the latest news on Cruis’n Blast. Super Arcade Finally Gets The Thumbs Up To Build In Azusa – The case of Super Arcade has been a long, hard fought battle but finally the City of Azusa is letting them move forward on building. We look forward to seeing the new Super Arcade in action! 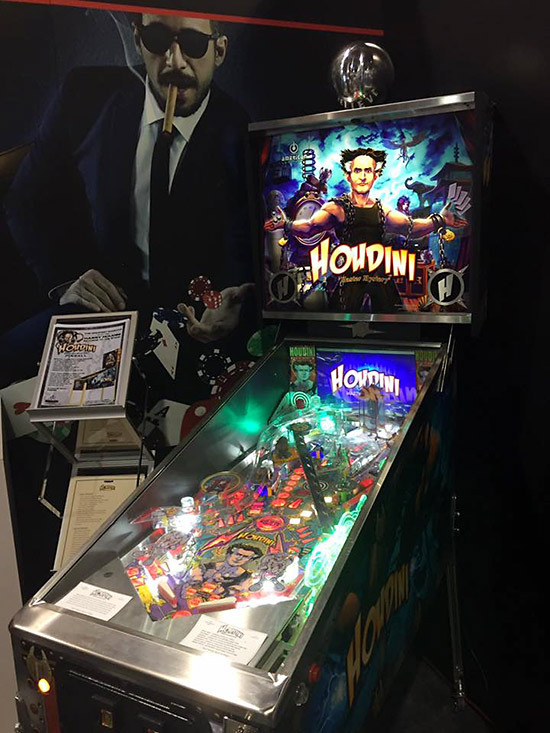 John Popadiuk Returns With Houdini Pinball – He is known for designing some of the more beloved pinball machines in the 90s (Theatre of Magic, Cirqus Voltaire, Tales of the Arabian Nights) but in recent times, John Popadiuk has gone through a bumpy ride. Looking to move on from that, he has designed Houdini: Master Mystery, which is going to be built by a new company by the name of American Pinball. We’ll keep an eye on this but if you are interested in finding out more about this new machine, check out Pinballnews.com. Don’t tamper with other people’s arcade machines – Assuming that this story as told on Reddit is accurate, perhaps a new rule is going to be posted at D&B regarding use of their machines. I get that people are passionate about their games and D&B would have some fault for leaving the coin door open but that doesn’t give you permission to do anything with someone else’s arcade machine. If you want a game updated that badly, go through the right channels. Otherwise, there are a number of things that can go wrong and would make you liable for any damage and on top of that, even though arcade machines are there for people to play, that does not make them your property. Guess what kind of installed software you always see when you get a used pinball/play a non-working pinball on location with a certain assembly being damaged. From my understanding of D&B, most of them do try and keep the games up-to-date. I could be wrong about that but that is what I have heard. It’s possible they would have updated the machine had the player bothered to get the manager in on it but instead he made efforts to hide the update and not let them know that someone left the machine open. In my area, I know of a group of rhythm gamers who have built up a solid relationship with the venues that have the games they want to play. They are then able to get permission to make repairs and often the venue calls them to fix the machine if something goes wrong. If a location is run by an incompetent staff that still doesn’t give anyone the right to update the machine. If they don’t care enough to do so, then that is what competition is for (in fact there is another PIU unit near where this D&B incident took place that is up-to-date). If anyone cares that much when the location doesn’t, then they should patronize other locations that do bother to update the game. Or startup their own if they are so inclined. By what I’ve seen, locations that don’t care to update/repair games tend to lose business and end up getting closed. However a good majority of players never report issues to the staff. It would be great if they did as that helps keep a location running smoothly. A location with solid games also earns better so any business owner with sense wants players who interact with them to be there and work with them. But doing it in secret is how you ruin those chances.